Today I present the second of the two faction that will be part of the campaign, starting with the Whitebark Clan, who are known to many as a strong and ever resilient group of Sylvaneth. Enjoy! The Whitebark Clan are seedlings of the Ironbark Clan, inheriting all traits of tenacity and resilience. Named Whitebark for their steely white bark and constantly being pure of mind, no matter the situation. 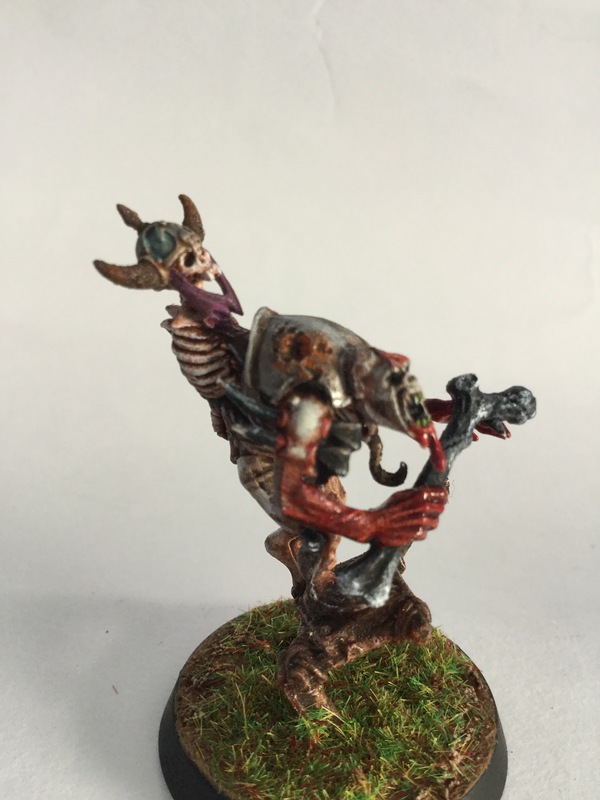 Created at the beginning of the Age of Chaos, their purpose was to help defend their forbearer’s Glade within the realm of Chamon against the coming onslaught of chaos. During this time, they fought the forces of Tzeentch, holding them at bay thanks to their steely bodies and wills of iron. Although they were not alone, they became staunch allies with the Duardin, as their forbearer’s were and still are to this day. As the never ending Chaos onslaught continued and the realms were falling, Sylvaneth from all the realms were retreating to Ghyran to help defend their homeland against the forces of Nurgle. Due to the sheer desperation of the homeland falling, the Archduke of the Ironbark Clan ordered the Whitebark Clan to retreat to Ghyran to help defend their homeland. The numerous battles against the forces of Nurgle reaped high tolls on both sides as they were resilient to the unatural diseases of Nurgle, though this would not be enough. The forces of Nurgle had claimed and corrupted much of Ghyran forcing the Whitebarks along with the rest of the Sylvaneth to retreat to the hidden enclaves of Athelwyrd, now waiting on the grieving Alarielle for the next move. Treeman Anceint; Duke Cuirithir– First seedling and appointed Lord of the Whitebark Clan by Archduke of the Ironbark Clan. Known as the ‘Gnarled warrior’ Duke Cuirithir ignores blows that may cleave that of a weaker being thanks to his relentless will. This is also aided by his ‘Briarsheath’ which almost makes his body as unfathomable as his mind, making blows hard to hit. He is also adept at spell caster, known for his power of ‘Regrowth’. He leads his Clan with unwavering tenacity and loyalty against those that know none. From a cowardly and dishonourable Skaven to the Vile and barbaric Chaos forces, he will not falter! Dryads- Dames of the Iron Tear– Battle maidens of the Clan, the Dames of the Iron Tear serve as the Duke’s personal guard and protectors of the land. From defending their Lord in battle to tending to the trees in the Glade, they serve with love and loyalty like no other. Treeman; Guardian Alduinian– Appointed Guardian of the Whitebark Clan and Household, Alduinian is the epitome of the Whitebarks traits and ideals, always in the front lines acting as the bastion against any foe. Although he has the next highest ranking Whitebark under Lord of the Clan, he leaves the commanding of the household in more than capable hands of Matriarch Whiltlerna. Seeing himself more as an advisor, but more importantly a wall against a sea of savagery. Treeman Revenants; knights of the Iron Scale– Protectors of an ancient time, the Knights of the Iron Scale are said to have been those of a proud and stubborn lineage. Haughty in nature they see themselves as the perfect Knights and undeniably the best. While others see this as arrogance, there is no doubt of their abilities. In the midst of battle they are a sight to behold, fighting as if it were child’s play. While these traits may precive them as selfish, there is no question that they would gladly give their lives to protect their allies. That’s all for the Whitebark Clan factions backstory and key characters that shape the factions identity and ideals. I would very much like to thank my friend, Chris for contributing notes that were all used on the post, with his factions backstory and all of the characters lore within the faction. Stormcast, marines and the Word Bearers! Just a quick little post of pictures that I thought might be cool to show 🙂. 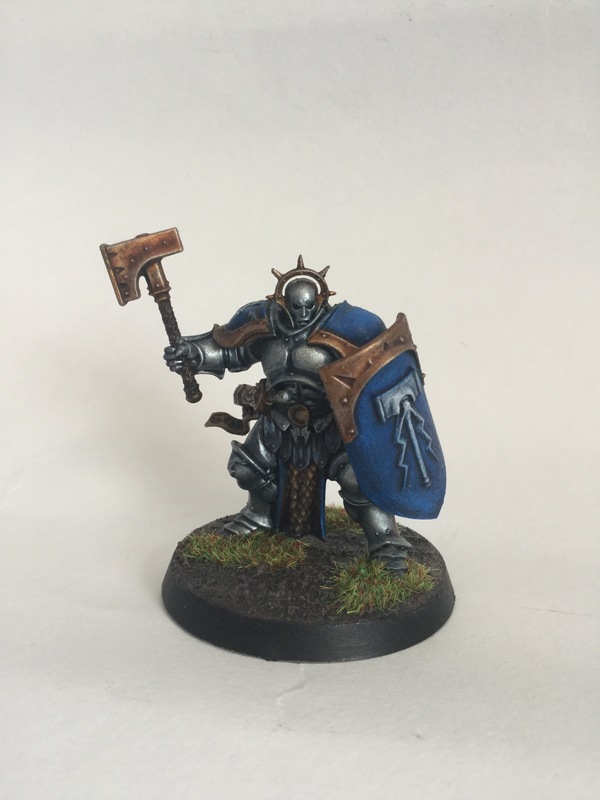 So for starters, here is my first Stormcast Eternal Liberator that I got from the starter magazine. Hailing from the Hallowed Knights brotherhood, this model will be part of my future plans for my last faction for the Order Alliegence. But as my regular readers will know, I’ve got too many projects to do currently. 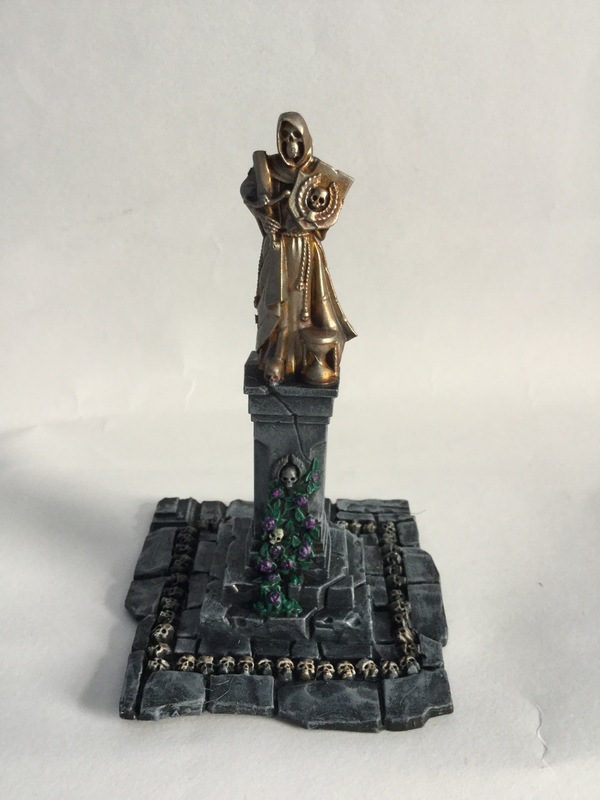 So for now, I’m keeping myself away from starting a small Stormcast Eternal collection. 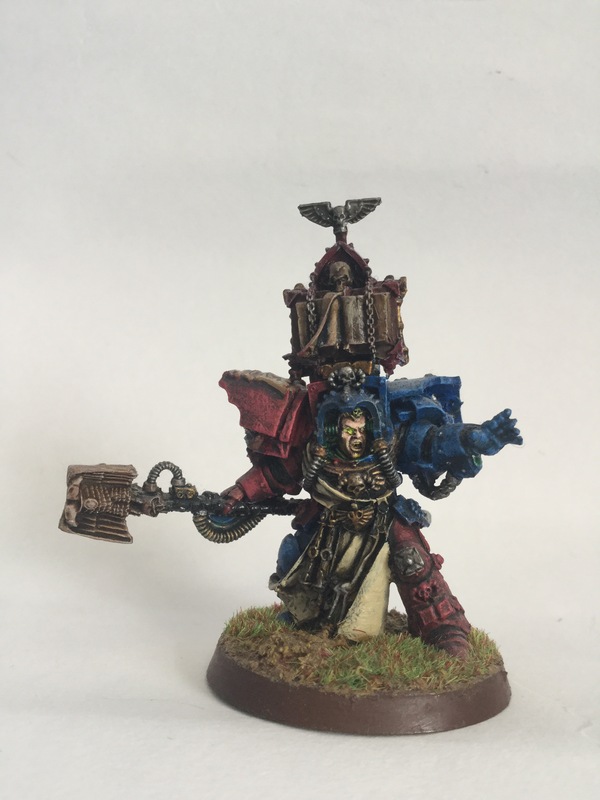 Next we have a librarian in Terminator armour, and a tactical Space marine of the Brazen Claws chapter. 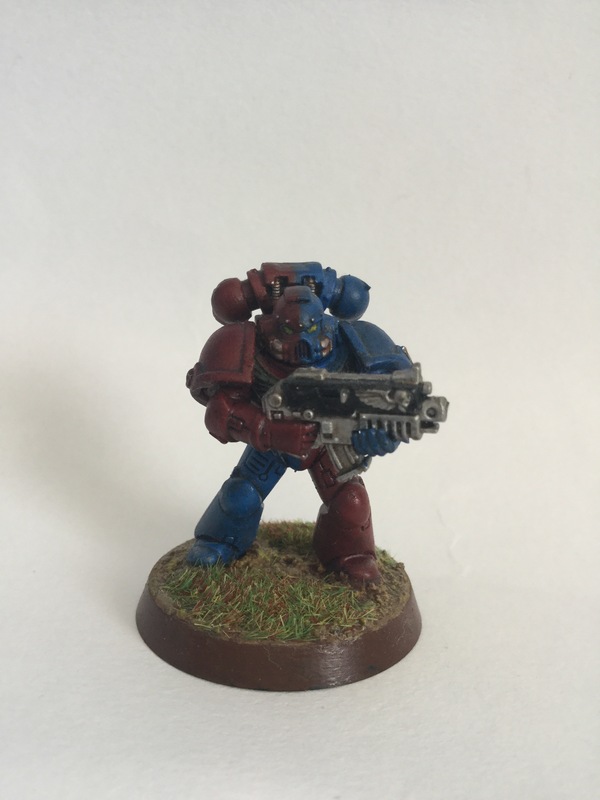 Before Age of Sigmar came, I’ve been building up a small collection of Space marines that I’ve based on the successor chapter. Sadly the project and motivation was stopped when AoS came out, and brought me back into fantasy. But one day I hope to return to the 41st millennium and finish my collection. Finally, we have the Word Bearers! Now these guys are my favourite models from my 40k collection, inspired by the HH novel, The first Heretic by Aaron Dembski Bowden. I liked how the First Heretic explored the roots of the Word Bearers, and how they were set on the path to dammnation. I’ve kept the crimson red as close to the colour tones as their artistic depiction, rather than confusing them as fallen Blood Angels. Speaking of Blood Angels, notice the faded symbol of the chapters icon on the Dreadknoughts coffin casket? 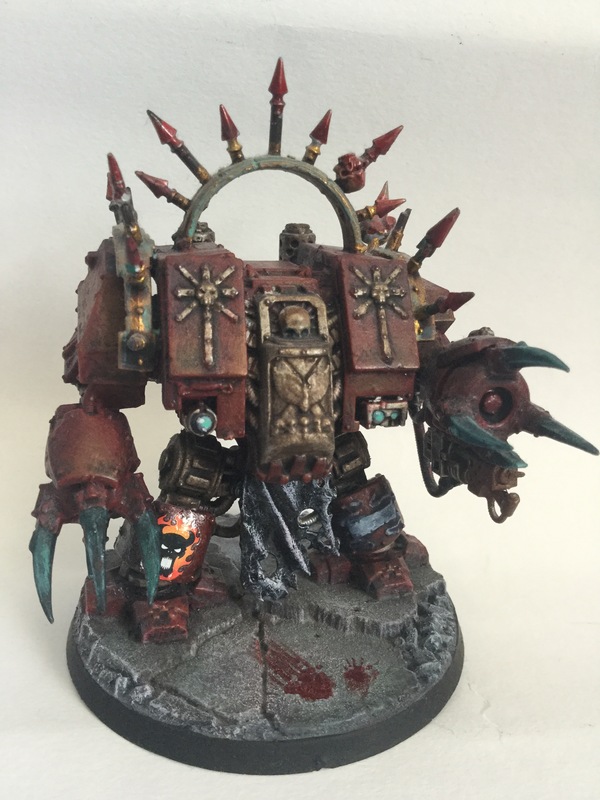 I wanted to add some mystery as to wether this was once a loyal Angel that went traitor from his uncontrollable Black Rage, or a scavenged Dreadknought that’s been rebuilt as a Helbrute. Today I present the first part of the two faction backstorys, who will be part of the campagin in the realm of Ghyran. This time, we delve deep into the paranoid, egotistical and cowardly nature of a particular Skaven Clan know as Clan Skelnix. Enjoy! To know the origins of Clan Skelnix, one must look not to the beginning, but rather from the end. 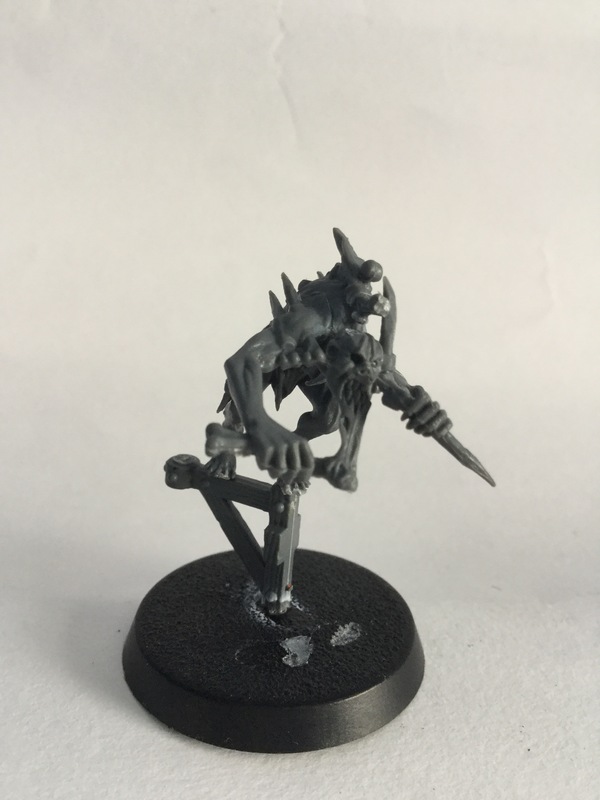 The Skelnix Clan was led by a cunning and ancient Verminlord Corrupter known as Sektretch, a devoted demigod who follows the path of pestilens. He remembers the final days during World-that-was, for he and thirteen Verminlords of a forgotten Clan were at the chaotic fields of war, as Archaon was within reach of the End Times. Instead of helping his demigod kin when everything fell to darkness, he betrayed them by ambushing them against thirteen Veminlord Corrupters in a deep hollow canyon. What his Clan kin and allied ambushers didn’t know, was that he cunningly led them all into a bigger trap in form of a ritual circle. As Clan against Clan fought against each other, Sektretch enacted one of the thirteen words of the Horned Rat to spread a vile smog of poisonous red gas on the Verminlords, as they choked to death in agony. This was rumoured to be one of the Thirteen Great Plagues, but this is still disputed as a trick by the Verminlord Corrupter to scare enemy Clans who would trespass his land. As the dust settles, Sektretch collected the bodies of his kin, and enacted a ritual to create a gateway to saftey away from the dying world. However, pleased by the cowardly and deceptive skills of the demigod, the Great Horned Rat disrupted the Verminlord’s escape, appeareing as a spectral smoke of darkness in form of a daemon horned rat, and grabbed Sektretch into the smoke of dark oblivion, never to be seen again. 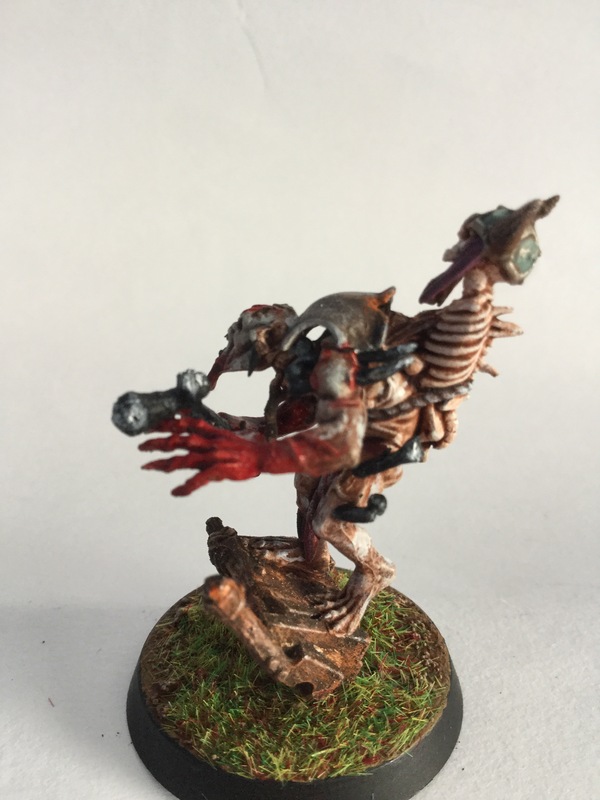 In truth however, Sektretch would still live on, preserved by his vile God, he was sent through the deep darkness for what seemed like an eternity, until he was thrown into one of the Mortal realms, the realm of Ghurr. When he arrived in the realm, he found a mixed Clan of sub Skaven factions who were battling a civil war for dominance. Sektretch having arrived at an optitunity to start his grand plans, appeared to his new servents as a towering demigod, and ordered them to stand down. The Skaven saw this demigod with fear in their eyes, bowing feverishly before the Corrupter incarnation of the Horned Rat. 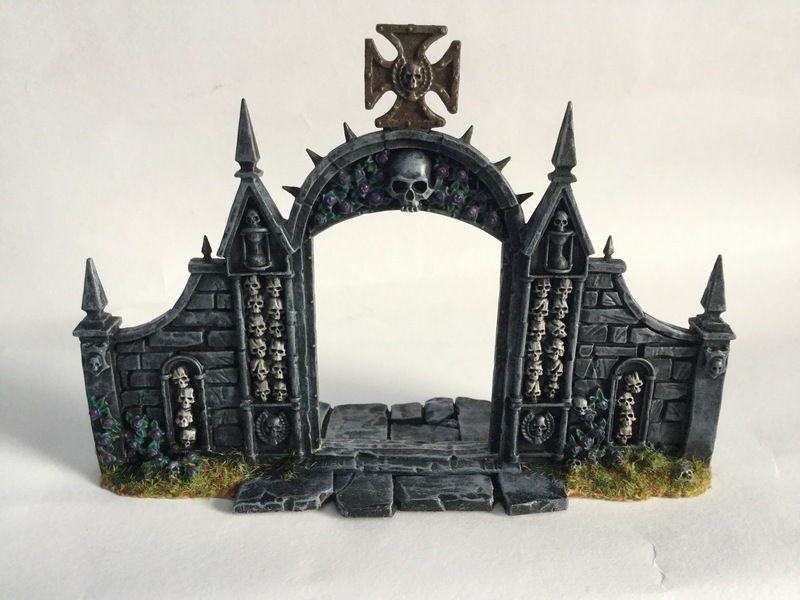 As the Clan now followed the leadership of the Verminlord Corrupter, they burrowed deep into the ground to create a under hive, building a city of accursed cathedrals to devote to the Horned Rat by ringing the bells thirteen times to their God, and making breeding grounds for the Clan to grow in size. The Clan had been keeping to themselves in their hive for many years during the Age of Myth, building their time for the day to strike at the land dwellers. 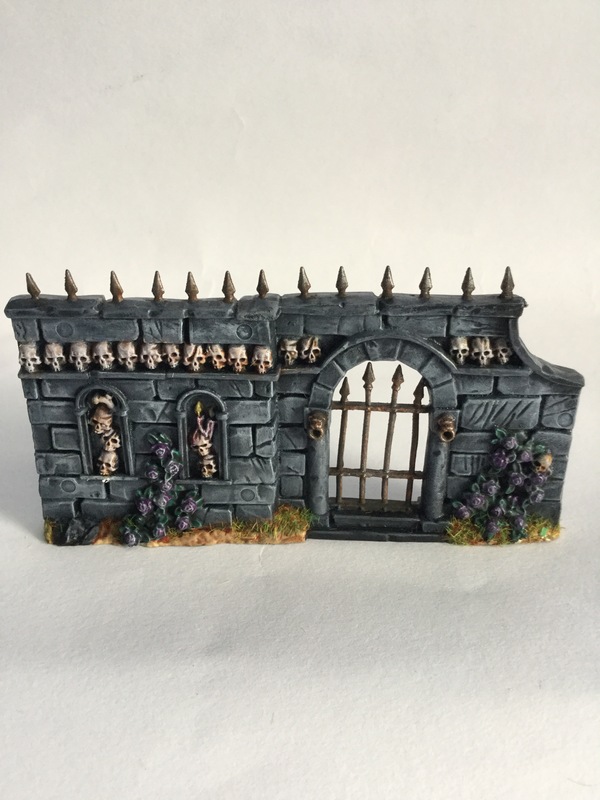 Then, the Age of Chaos came to the mortal realms…..
During this time of great disparity, Clan Skelnix came out of the shadows in a sea of teeming horde of rats. Civilisations that were once on Ghur’s eastern isle lands of Gar-Drake were wiped out with no mercy. Soon, the isle became new under-hives for the Clan to grow and colonise for expansion. Soon the Clan became infamous throughout the main land of Gar-Drake, for their supplies of food and trade ships were bombarded by Skaven fleets, meeting a grisly fate by the hands of Warlord Scarus, the right Claw. Years later, the main land would suffer from their lack of supply’s, making them an easy picking for Clan Skelnix to swarm and devour. 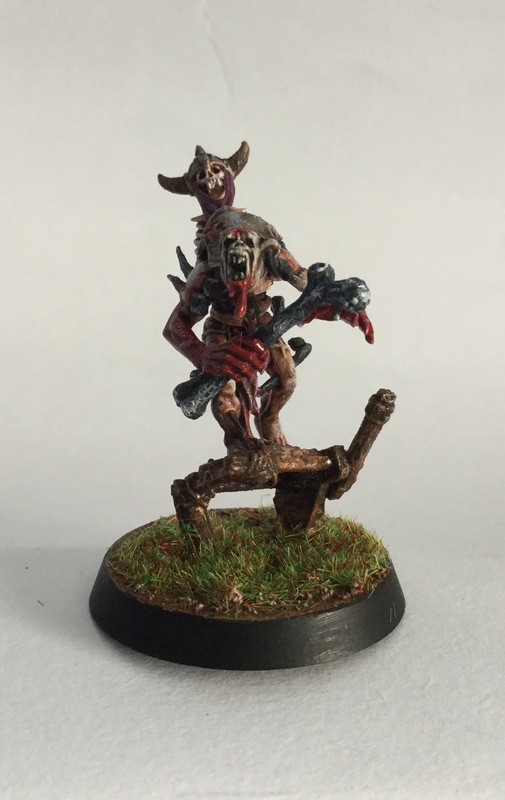 However, just as the Age of Sigmar was about to start, Sektretch was informed by the Great Horned Rat to go to Ghyran to join Clan Pestilens to war. The Verminlord had no means of getting to Ghyran unless he had enough sacrifices to create a big enough wormhole to get the Skaven horde there. So he made an unstable small wormhole to send his second in command of the Verminous fleet, Warlord Scarus, the right Claw. Leading a small warband into the realm to establish a base of operations, for which they can build a gateway for Sektretch and the Skaven horde to travel through. If they are successful, the Clan can make their push to join Clan Pestilens to claim the realm of life to the Great Horned Rat. 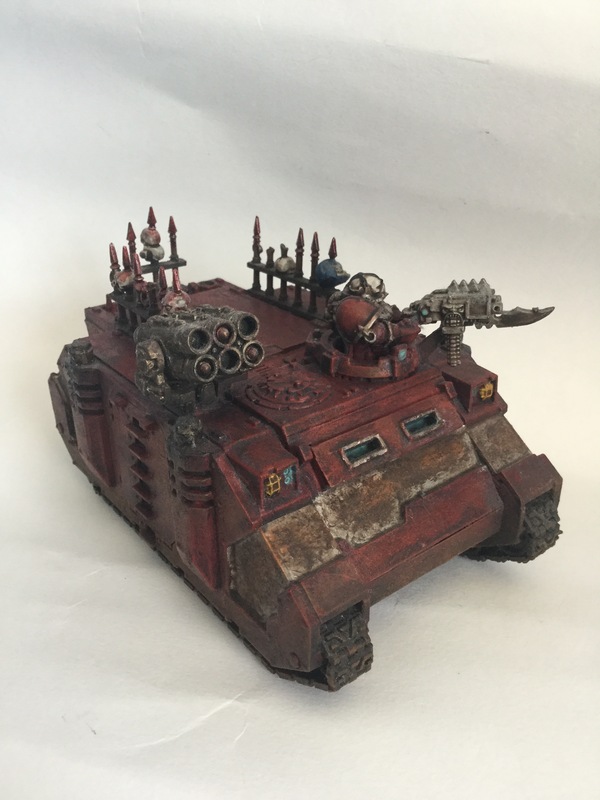 Warlord Scarus, the right Claw- A deceitful schemer within the Verminous branch of Clan Skelnix, Scarus had made a name for himself as a fleet master of the Clan. Having been chosen as the right Claw, which means that he is on the top rank to order the verminous branch as he pleases. He uses his close combat skills to deal striking blows to the foe, and to scurry away afterwards from returning blows. This has proved to work as he still lives another day, making him a deadly advisary should one dare challenge him in a duel. Arch-Warlock; Letrix– Maddend by his complex mind for building his strange machine gear, Letrix is known to be a wild lunatic when he uses his contraptions in battle. Raised to learn the craft of Skryre engineering, he quickly became adept in crafting his skills as a warlock engineer. After the demise of Arch- Warlock Sarstrix, Letrix took on the mantle of Arch-Warlock donning himself in the Clans power armoured steam suit. Whenever he finds an enemy worth his time, he’ll use his favoured spell, ‘Warpstorm’ to annihilate them with a malice glare of madness. Gutter Runners; The Thirteenth shadows– These mysterious assassins are known to show no mercy in any form when contracted to take down key targets, even if it’s their own kin. Formed to take out enemy wizards and generals that are causing too much unwanted trouble, the Gutter Runners hide in the shadows until their target is within range to take down. A vital component in the warband’s success to win their battles, the Thirteenth Shadows provid a means to deal real damage to the enemy within the shadows. Stormvermin; The Skrretch Guards– The guards are formed as the back bone of Scarus’s warband, providing much needed close combat skills, and troop power to push the Screaming Bell into battle. They have been know to cause swift damage to the enemy by their skills in using their Halberd, depleting their foes in numbers before they can even return their attacks. Giant Rats– The Giant Rats are used purely as a distraction units, to keep the enemy slow in the advance in battle. They are weak, but they still provided a much needed use when Scarus needs time to change formation and tactics. Grey Seer; Scretch– A wise advisor to Scarus when he needs his advisors guidance, Scretch is an essential part of Scarus’s warband (even if he manipulates the warlords choices to better his ego). Born as a grey fur Ratling, he was raised to learn the secrets of the Grey seer’s dark magic. He became a great seer during his time with the Masterclan branch, scheming his way to the top as the rest fall below him. He was gifted the horrendous Screaming Bell after he recovered an ancient bell of the Horned Rat in a Duardin cave that’s been guarded by the Fyreslayers. He now rides on a Screaming Bell that tolls constantly, a behemoth that towers even the might of Scarus. Could this be a sign of who’s really in charge? 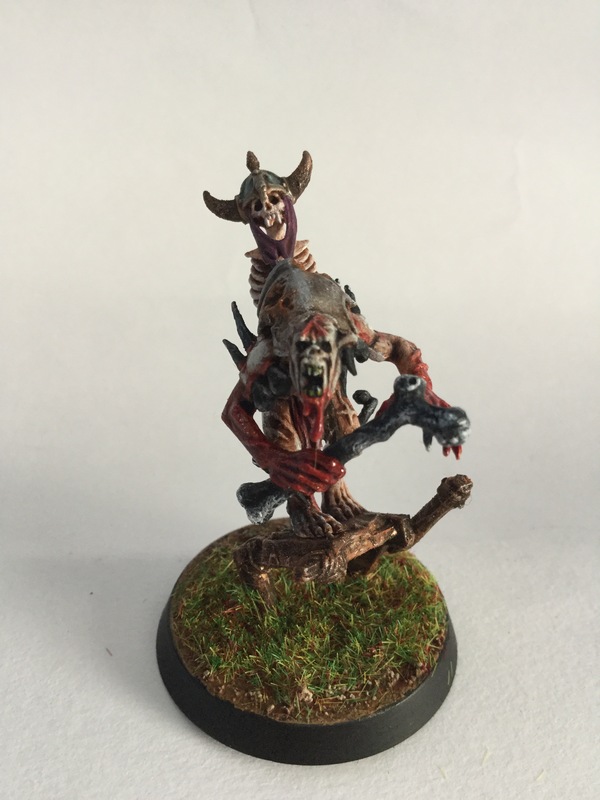 Today is a start of a new blog series that will follow me and my friend, Chris, on our AoS battles, using the Path to Glory rules. The campaign is set in the forests of Ghyran, during the time when Alarielle has nearly lost her once bountiful land to the foul infestation of Nurgles corruption. The armies that’ll be featured are my allied Skaven force, Clan Skelnix, and my friends Sylvaneth army, The Whitebark Clan. Below is a brief story of how the campagin started for both factions. During the war of Ghyran, Grandfarther Nurgle had nearly reshaped the realm of life into a massive garden of disease and decay. The Sylvaneth tried all their might to repell the Daemon hordes of Nurgle, but weak they are to stop the inevitable. However, few still stand to defend their forests from decay, one such group are The Whitebark Clan. The clan is a seedling of the Ironbark clan, who are known to have tenacity and resilience in times of strife. They stand to defend their homes with iron courage, and fierce rage against any invaders. Led by Treeman Ancient Duke Cuirithir, a wise and tough Treeman who has fought beside his tree folk and Duardin Allies for many years. But, as they scouted the woodland glades for any signs of enemy forces, they encountered a teeming warband of Skaven. These Skaven are from the Clan Skelnix, a cunning and cowardly clan who have no empathy for anyone or anything else, but for their own egos. 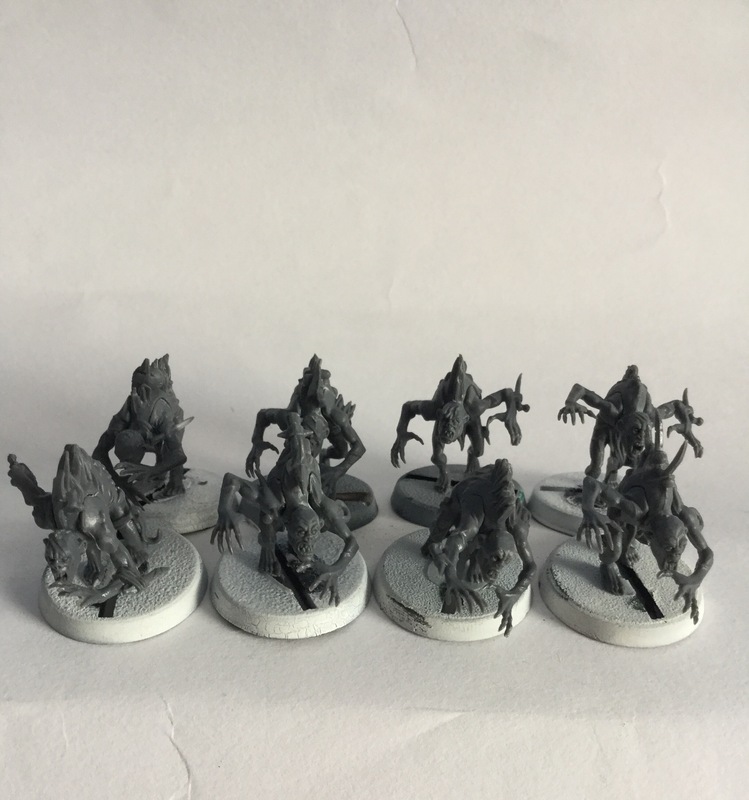 They have come to Ghyran by a small wormhole lead by Scarus the right claw, to make a new breeding home, and create a bigger wormhole to reinforce their scout warband. The Whitebark Clan are ready to defend their outpost and make a full on surprise attack on Clan Skelnix, but are they too late to stop Scarus the right claw from building a wormhole gate? Now that the warbands are ready, we planned the battles scenario based on battleplans to make each battle varied and unique, during each of the last games result. For each battle, I’ll be posting a narrative story post, based on the events of that game from our Path to Glory campagin. The next posts in the series will be our Warbands backstorys, detailing our factions past and notable characters in the warband. [Note: I want to thank my friend, Chris for contributing his Warband, The Whitebark Clan, character names and backstory for the blog series]. Changes to my blog site! This is a short post about what the changes are to my blog site, and what I’ll be posting on my blog. So if you’ve noticed on my blog page, I’ve made a static page which addresses what my blog post is about, with a list of subject sections that will be featured on my blog. 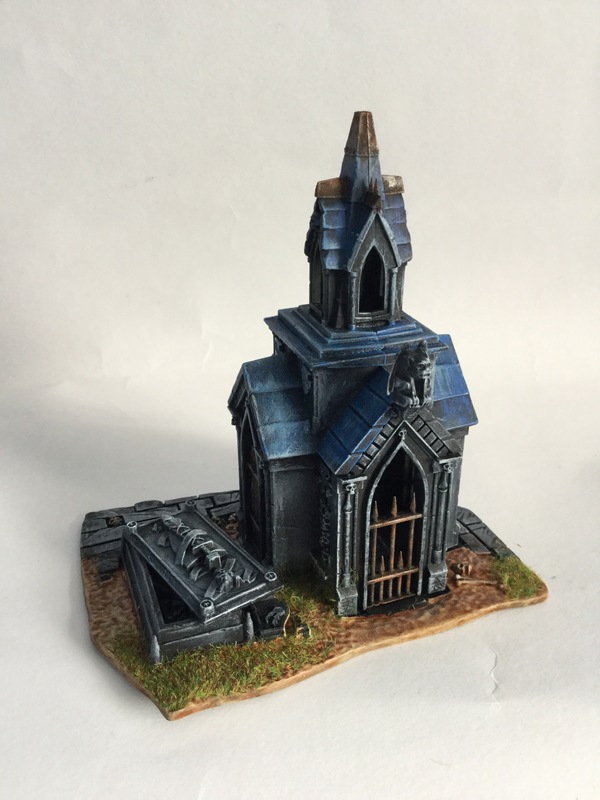 Warhammer Age of Sigmar model collecting journey. 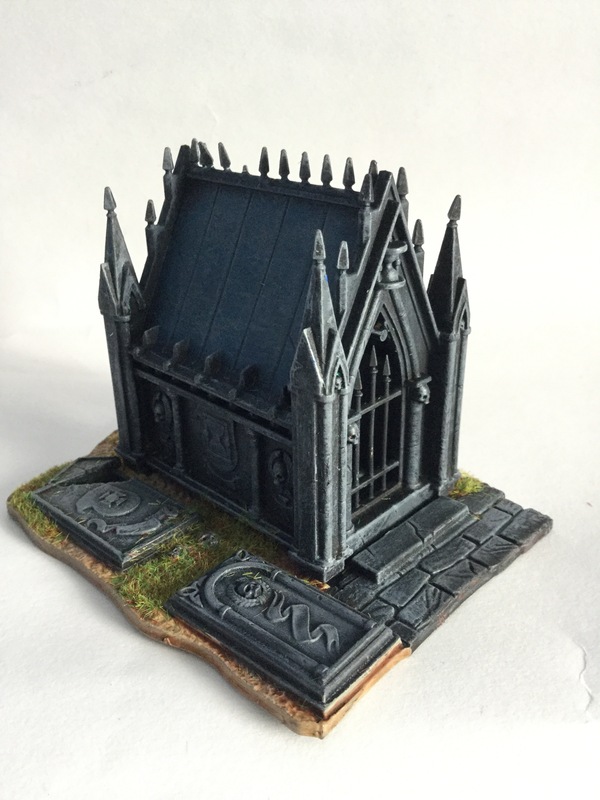 This weekend I’ve been busy painting my ongoing process painting a graveyard for AoS scenery, and painting my first Crypt Ghast courtier for my Flesh-eater courts. 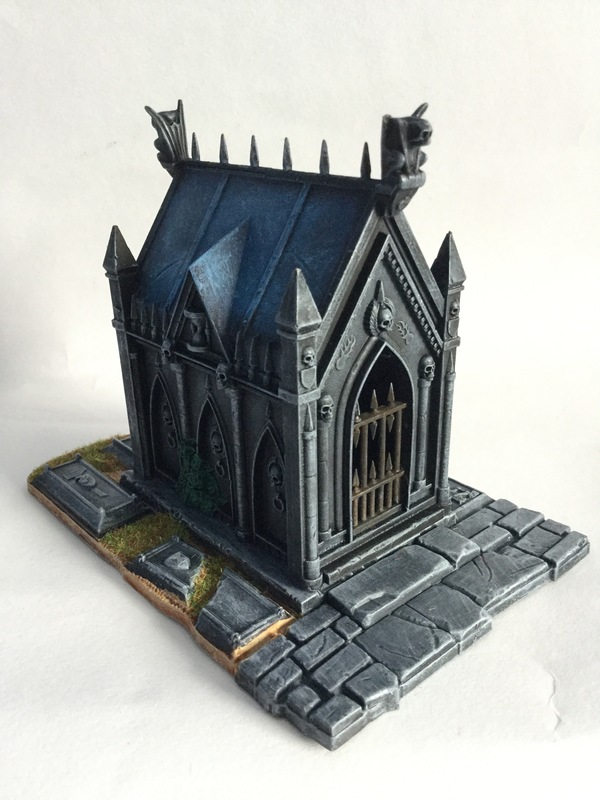 Whilst the scenery is not entirely finished as a whole, I’ve decided to post what I’ve done so far from the kit. That’s all I have for this post, however I will be making a new post later on today which will adress some changes that I’ll be doing for my blog site. A bit of a change around for my Aelfs in terms of what they’ll be in theme and backstory wise. This will be a new blog series that’ll replace ‘The Dovaskar Legacey’ as that gotten nowhere for me :(. But after a long think about what I should do instead, I’ve decided to mainly focus on my Aelfs as their own entity. There won’t be any lore behind the models for the narrative, but instead I’ll hint some clues as to what will be next (just to see if anyone can guess it right). 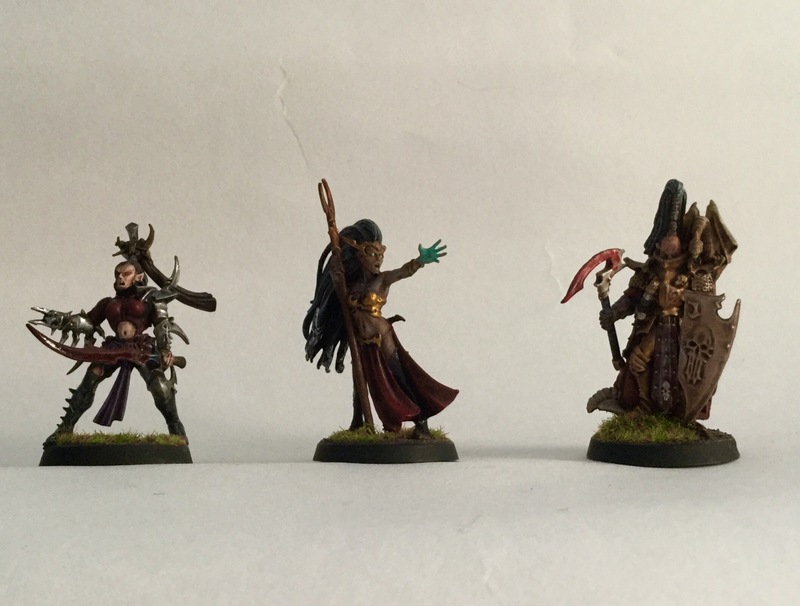 I had these on the waiting list for some time now, so I’ve finally decided to post this as my first re-introduction to my Aelf army. As you’ll notice, my Dreadlord (right) is on a newly decorated base (25mm) to fit in with the rest of the army. My sorcerer (middel) will mainly be leading my Darkling covern to war with her arcane skills (and sacrificing weak solider’s from the infantry to boost her powers). She’ll be the army’s more notable presence on the front line, staying within a unit of twenty dreadspears. Finally on the left is a Tenebrael shard, made by using wytch leader from a dark Eldar kit. Originally this model was supposed to be leader of the shades unit, but sadly the shades aren’t really cannon in the new setting (however, they can still be playable, so it’s not all that bad 🙂 ). Finally, here’s a clue at what’s to come on the next part of this series, I’ll make it an easy one as it’s the first one. Good luck! It strike’s like the sharpest metal of pure malice, shredding foes from its path. Only two are needed to control it, using their knowledge to make the most out of its terrible power.